You are browsing Pancake Recipes Archives - Recipes. This oven baked pancake is a type of breakfast cake. It’s easy to make and tastes amazing! Splurge on fancy pancakes that are extra delicious and fun. Add some bananas and some nuts to your pancakes. 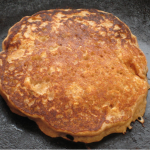 This pancake recipe is great for banana lovers. This recipe is as fancy as you will find in an exclusive breakfast club; your friends and family will think that you spent hours making a special breakfast just for them. Gingerbread Pancakes to spice up your morning! Follow this recipe and add raisins and sunflower seeds to your wheat pancakes for a truly hearty pancake breakfast. The flavor of these pancakes really shines. Zesty lemon with poppy seeds and a whole wheat pancake make for one great breakfast. The orange zest makes this a fun twist on traditional whole wheat blueberry pancakes.